First manned test of the Lunar Module. First test of the Apollo space suits. First manned flight of a spacecraft incapable of returning to earth. If rendezvous of the Lunar Module with the Apollo CSM had failed, crew would have been stranded in orbit. AKA: Gumdrop/Spider. Launched: 1969-03-03. Returned: 1969-03-13. Number crew: 3 . Duration: 10.04 days. Location: Michigan Space Center, Jackson, MI. Apollo 9 (AS-504), the first manned flight with the lunar module (LM-3), was launched from Pad A, Launch Complex 39, KSC, on a Saturn V launch vehicle at 11:00 a.m. EST March 3. Originally scheduled for a February 28 liftoff, the launch had been delayed to allow crew members James A. McDivitt, David R. Scott, and Russell L. Schweickart to recover from a mild virus respiratory illness. Following a normal launch phase, the S-IVB stage inserted the spacecraft into an orbit of 192.3 by 189.3 kilometers. After post-insertion checkout, CSM 104 separated from the S-IVB, was transposed, and docked with the LM. At 3:08 p.m. EST, the docked spacecraft were separated from the S-IVB, which was then placed on an earth-escape trajectory. On March 4 the crew tracked landmarks, conducted pitch and roll yaw maneuvers, and increased the apogee by service propulsion system burns. The Apollo 9 CM splashed down in the Atlantic 290 kilometers east of the Bahamas at 12:01 p.m. EST. The crew was picked up by helicopter and flown to the recovery ship U.S.S. Guadalcanal within one hour after splashdown. Primary objectives of the flight were successfully accomplished. For the 19th flight of American astronauts into space, Vice President Spiro T. Agnew, representing the new administration of Richard Nixon, sat in the firing control room viewing area on 3 March 1969. He and other guests listened to the countdown of the tall Saturn-Apollo structure several kilometers away at the edge of the Florida beach. Fully recovered from their stuffy heads and runny noses, McDivitt, Scott, and Schweickart lay in the mixed-atmosphere cabin of CSM-104. Breathing pure oxygen through the suit system, they tried to adjust an inlet valve that seemed to have two temperature ranges - too hot and too cold. That was their only problem. Less than one second after its scheduled 11:00 a.m. EST liftoff time, Apollo 9 rumbled upward. In Houston, where more than 200 newsmen had registered to cover the mission, Flight Director Eugene F. Kranz and Mission Director George H. Hage watched the displays on their consoles while McDivitt and CapCom Stuart Roosa called off the events of the launch sequence. There were the usual vibrations but, on the whole, the Saturn V's S-IC stage gave the crew what McDivitt called "an old lady's ride" - very smooth. The big surprise came when its five engines stopped thrusting. Feeling as if they were being shoved back to the earth, the astronauts lurched forward, almost into the instrument panel. The S-II second stage engines then cut in and pressed them back into the couches. Everything went well until the seven-minute mark, when the old pogo problem popped up again. Although the oscillations were greater than those of Borman's flight, McDivitt's crew lodged no complaints. At 11 minutes 13 seconds from launch, the S-IVB third stage kicked itself and the two spacecraft into orbit 190 kilometers above the earth. Upon reaching the orbital station, the trio remembered Borman's warning against jumping out of the couches too quickly and flitting about in the weightless cabin. The men avoided sudden head turns, made slow deliberate movements, took medication - and still felt dizzy. 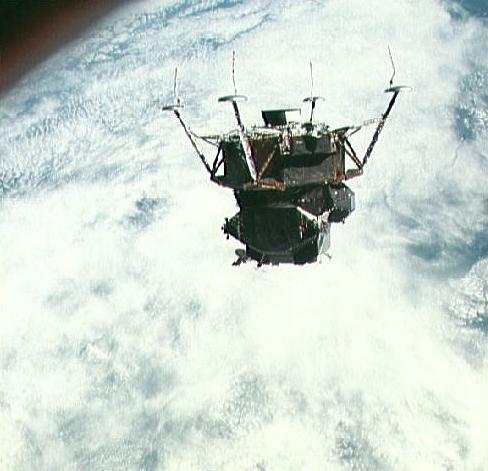 But they were able to go about their duties, checking instruments and extending the docking probe. After more than a circuit, 2 hours 43 minutes into the mission, Scott lit the pyrotechnics that separated the command and service modules from the S-IVB stage and began one of the critical steps in the lunar-orbit concept. He fired the thrusters and pulled the command ship away, turned the ship around, fired again, and drew near what he called the "big fellow." Then he noticed that the command module's nose was out of line with the lander's nose. Scott tried to use a service module thruster to turn left, but that jet was not operating. The crew then flipped some switches, which started the thruster working, and at 3 hours 2 minutes the command module probe nestled into the lunar module drogue, where it was captured and held by the latches. After docking, McDivitt and Schweickart began preparing for their eventual entry into the lunar module. First, they opened a valve to pressurize the tunnel between the two spacecraft. With Scott reading the checklist aloud, McDivitt and Schweickart removed the command module hatch and checked the 12 latches on the docking ring to verify the seal. Next they connected the electrical umbilical lines that would provide command module power to the lander while the vehicles were docked. McDivitt checked the drogue carefully and found no large scars. Meanwhile, Schweickart glanced out the spacecraft window and failed to see the lunar module in the darkness, which scared him. "Oh, my God!" he exclaimed, "I just looked out the window and the LM wasn't there." Scott laughed and said it would be "pretty hard [not to] have a LM out there . . . with Jim in the tunnel." McDivitt put the hatch back in place until time to transfer into the lander. About an hour later, an ejection mechanism kicked the docked spacecraft away from the S-IVB. 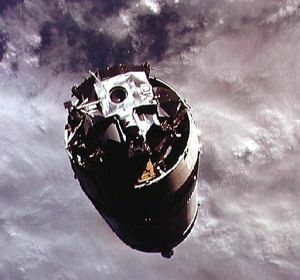 Apollo 9 backed away, and the Saturn third stage, after firing twice, headed for solar orbit. McDivitt's crew then turned to another trailblazing task - firing the service module propulsion system. Astronauts had in the past used one vehicle to push another into higher orbit, but never a craft as big as the lander. Some six hours into the mission, they made the first test burn, which lasted five seconds. Flight controllers in Houston considered this the most critical of the docked service module engine firings. Scott must have agreed with them, because he exclaimed, "The LM is still there, by God!" The engine had come on abruptly, McDivitt later said; with the tremendous mass, however, acceleration was very slow - it took the whole 5 seconds to add 11 meters per second to the speed. Sixteen hours after this short burst, a second propulsion system ignition, lasting 110 seconds, included gimbaling (or swiveling) the engine to find out whether the guidance and navigation system's autopilot could steady the spacecraft. The autopilot stilled the motions within 5 seconds. The crewmen grew more and more confident that they could handle their machines. And that was a good thing, since they next had to make a 280-second burn, to produce an added velocity of 783 meters per second. This lightened the service module's fuel load by 8,462 kilograms and made it easier to turn the vehicles with the reaction control jets. The firing also altered the flight path and raised the apogee of the orbit from 357 to 509 kilometers, to provide better ground tracking and lighting conditions during the rendezvous. Scott later reported that they had the sensation that the docked vehicles were bending slightly in the tunnel area, but the maneuver produced oscillations only one-third to one-half as large as they had expected from training. As the big engine fired, McDivitt commented, "SPS . . . is no sweat." The astronauts were growing so used to the propulsion system that they hardly mentioned its fourth burn. Perhaps they were thinking of their next trailblazing chore, when two of them would crawl into the lunar module and check out its systems. After they woke in the morning and ate breakfast, McDivitt and Schweickart put on their pressure suits. Schweickart suddenly vomited. Fortunately, he kept his mouth shut until he could reach a bag. Although he did not feel particularly nauseated, both he and McDivitt became slightly disoriented when getting into their suits. For a few seconds, they could not tell up from down, which gave them a queasy feeling. Scott, already dressed, removed the command module hatch, the probe, and the drogue from the tunnel so his colleagues could get into the lunar module. Schweickart slid easily through the 81-centimeter tunnel, opened the lunar module hatch, and went next door in the first intervehicular transfer in space. After he had flipped all the necessary switches, Schweickart reported that the lander was certainly noisy, especially its environmental control system. McDivitt followed Schweickart into the lunar module an hour later. Within a brief time, a television camera had been unstowed and their activities were being beamed to the earth. Then they shut themselves off from Scott by closing their hatch while he was sealing himself off from Spider. A key event in lunar missions would be the deployment of the landing gear. 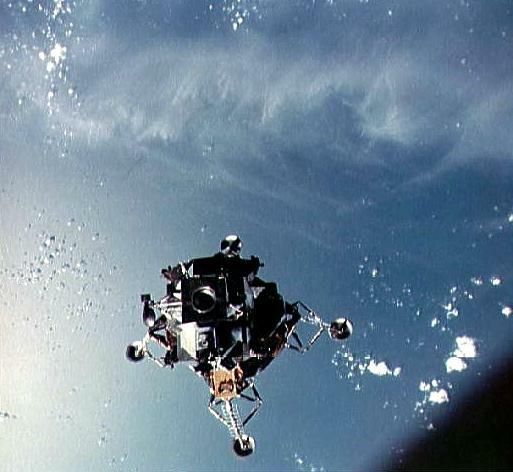 A second or two after Schweickart pushed the button, the lunar module's legs sprang smartly into place. After the vehicles separated, the lunar module would flip over so the command module pilot could make sure all four legs were in the proper position. Then Schweickart was sick again, and McDivitt asked for a private talk with the medical people. Although the news media were quickly informed of Schweickart's problem, this request for a "private" discussion was like waving a red flag, causing repercussions and a spate of unfriendly stories. On this second occasion, the impulse to vomit came on just as suddenly as as it had earlier, while Schweickart was busy flipping switches. Afterward, he felt much better and moved around the cabin normally, but he had lost his appetite for anything except liquids and fruits for the remainder of the voyage. As soon as he was sure the systems were operating properly, McDivitt asked Scott to put the command module into neutral control, so he could check out the lunar module's steering system. 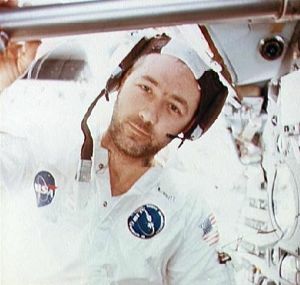 McDivitt then operated the small thrusters to get the docked vehicles into the correct position for firing the lunar module's throttleable descent propulsion system. Seconds after starting the large descent engine, McDivitt shouted, "Look at that [attitude] ball; my God, we hardly have any errors." Twenty-six seconds later, at full thrust, he reported that errors were still practically nonexistent. In fact, things were going so smoothly that halfway through the 371.5-second exercise, the commander felt hungry - not an uncommon sensation with him. So he ate before crawling back into the command module. Schweickart stayed behind to shut everything down and straighten up the cabin before joining the others in Gumdrop. The lander appeared to be a dependable machine. After Schweickart had vomited on two occasions, McDivitt was doubtful that the lunar module pilot would be able to handle his chores outside the spacecraft. The commander recommended to flight control that this exercise be limited to cabin depressurization. Flight control agreed that the extravehicular activity would consist of one daylight period, with Schweickart wearing the portable life support system and the lunar module umbilical hoses, and with both the lunar module and command module hatches open. On the fourth day of flight, working his way into the lander to get it ready, Schweickart felt livelier than he had expected. By the time he had put on the backpack, McDivitt was ready to let him do more - to stand on the porch at least. Flight control told the commander to use his own judgment. 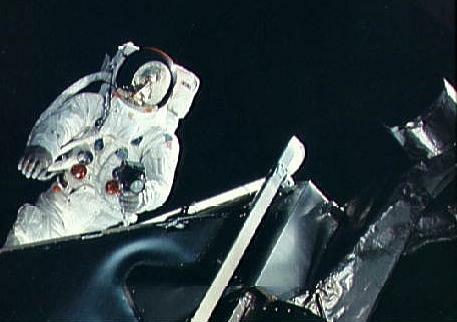 So McDivitt fastened Schweickart to the nylon-cord tether that would keep him from floating away from the spacecraft. Once Schweickart had entered this "third spacecraft," to become essentially a self-contained unit, flight control ran a communications check with PLSS, as they first called him. The four-way conversation - between Spider, Gumdrop, PLSS, and the Houston control center - was much clearer than they had expected. Lunar module depressurization also went smoothly. Schweickart could tell that his backpack was operating, since he could hear water gurgling while he watched his pressure indicator. He was quite comfortable. McDivitt had to use more force than he had anticipated to turn the hatch latch handle and more strength to swing the hatch inside. He was very careful to keep the door pushed back, fearing it might stick closed, leaving Schweickart outside. Once the lunar module hatch was opened, Scott pushed the command module hatch outward. 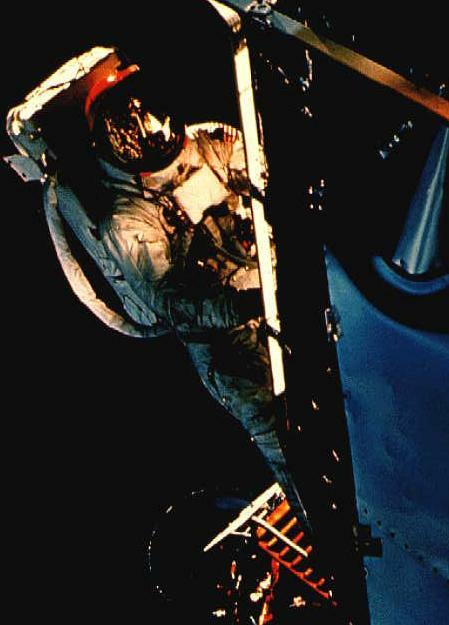 Schweickart, who now called himself Red Rover because of his rust-colored hair, enjoyed the view and did so well outside on the platform in the golden slippers that McDivitt decided to let him try out the handrails. Hanging on with one hand as he moved about, he took photographs and found that the handholds made everything easier than it had been in simulation, even in underwater training. He did not go over and visit Scott in the command module, but both pilots retrieved experiment samples from the spacecraft hulls. Scott and Schweickart also took pictures of each other, like tourists in a strange country. Originally scheduled to last more than two hours, the extravehicular period ended in less than one, partly because they did not want to tire Schweickart after his illness and partly because they had plenty to do to get ready for the next day's pathfinding activity, the key event of the entire mission: the separation and rendezvous of the lunar module and the command module. With the door closed and their life-sustaining outside equipment off, McDivitt and Schweickart recharged the backpack, tidied up the cabin, and returned to the command module. On both occasions when they had transferred to the lander, the pilots had been behind the schedule. On 7 March, they got up an hour earlier than usual. They also obtained permission from flight control to move into the lunar module without helmets and oxygen hoses, which made it easier to go through the checklist and to set up the module for the coming maneuvers. Soon both spacecraft were ready. When Scott tried to release the lunar module, however, it hung on the capture latches. He punched the button again and the lander dropped away. McDivitt watched the widening distance between the two craft. Spider then made a 90-degree pitch and a 360-degree yaw maneuver, so Scott could see its legs. After drifting around within 4 kilometers of the command module for 45 minutes, McDivitt fired the lunar module's descent propulsion engine to increase the distance to nearly 23 kilometers. The motor was smooth until it achieved 10-percent thrust. When McDivitt advanced the throttle to 20 percent, the engine chugged noisily. McDivitt stopped throttling and waited. Within seconds, the chugging stopped. He accelerated to 40 percent before shutting down and had no more problems. McDivitt and Schweickart checked the systems and fired the descent engine again, to a 10-percent throttle setting; this time it ran evenly. As they moved off in a nearly circular orbit 23 kilometers above the command module, they had no trouble seeing Gumdrop, even after the distance stretched to 90 kilometers. From the command module, Scott could spot the lander as far away as 160 kilometers with the help of a sextant. Estimating distances was difficult, but the radar furnished accurate figures. This new orbit, higher than that of the command ship, created the paradox associated with orbital mechanics of speeding up to go slow. Being higher above the earth (i.e., farther out from it) than the command module, the lander took longer to circle the globe. Spider gradually moved away, trailing 185 kilometers behind Gumdrop. To begin the rendezvous, McDivitt and Schweickart flipped their craft over and fired the thrusters against the flight path to slow their speed enough to drop below the command module's orbital path. Below and behind the command module, they would begin to catch up. They fired the pyrotechnics to dump the descent stage and leave it behind. The firing produced a cloud of debris and caused their blinking tracking light to fail. McDivitt commented that staging was "sort of a kick in the fanny . . . but it went all right." The distance between the lander and the command module soon shortened to 124 kilometers. McDivitt blipped the ascent engine for three seconds to circularize their orbit and begin a chase that would last for more than two hours. 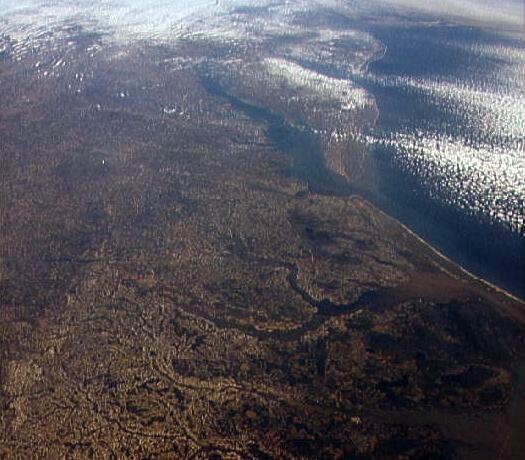 As the gap between the two craft narrowed, McDivitt spotted a very small Gumdrop at 75 kilometers. About an hour after the ascent engine firing, McDivitt and Schweickart lit off their spacecraft's thrusters. "It looks like the Fourth of July," McDivitt commented, and Scott responded that he could see them very clearly. When the thrusters stopped, however, Spider, without its tracking light, was hard for Scott to spot. At that point, remembering the problem they had breaking away, McDivitt told Scott to make sure the command module was ready for docking. As he approached the other craft, the commander turned his machine in all directions so Scott could inspect its exterior. More than six hours after leaving the command module, McDivitt settled the lander firmly back into place and then reported, "I have capture." The 12 latches on the docking ring caught the lunar module and held it fast. Another stretch of the trail to the moon had been blazed. The lunar module could leave the command module, find its way back to it, and dock safely. Even before crawling back into the command module, McDivitt said he was tired and ready for a three-day holiday. Another 140 hours would pass before touchdown in the Atlantic, but the crew had achieved more than 90 percent of the mission objectives. There were still things to do, such as making more service module engine burns (a total of eight throughout the flight) and jettisoning the ascent stage. Ground control radioed a firing signal to park the lunar module in a 6,965- by 235-kilometer orbit. The crew watched the departing craft a while and then settled down to the more mundane tasks of checking systems, conducting navigation sightings, and taking pictures. After 151 revolutions in 10 days, 1 hour, and 1 minute, Apollo 9 splashed safely down in the Atlantic, northeast of Puerto Rico, on 13 March 1969, completing a 6-million-kilometer flight that had cost an estimated $340 million. Less than an hour later, the crew was deposited, by helicopter, aboard the carrier U.S.S. Guadalcanal. Then the debriefings and celebrations began. At a ceremony in Washington, with an address by Vice President Agnew, lunar module development leaders Carroll Bolender of the Manned Spacecraft Center and Llewellyn Evans of Grumman were given the NASA Exceptional Service Medal and NASA Public Service Award, respectively. NASA officials were stimulated by the path-breaking voyage of Apollo 9. They were now ready for the final rehearsal, a mission that would take Apollo back to the vicinity of the moon. Family: Manned spaceflight. People: McDivitt, Schweickart, Scott. Country: USA. Spacecraft: Apollo CSM. Projects: Apollo. Launch Sites: Cape Canaveral. Agency: NASA Houston. Radiation levels predicted for Apollo LEM-3 crew - . Nation: USA. Program: Apollo. Flight: Apollo 9. Spacecraft: Apollo LM, LM Crew Station. Grumman completed an analysis of radiation levels that would be encountered by the LEM-3 crew during their earth orbital mission. Grumman advised that doses would not be harmful. To lessen these levels even further, the contractor recommended that during some parts of the mission the two astronauts climb back into the CM; also, the planned orbit for the LEM (556 by 2,500 km (300 by 1,350 nm)) could be changed to avoid the worst part of the Van Allen Belt. 1965 December 17 - . 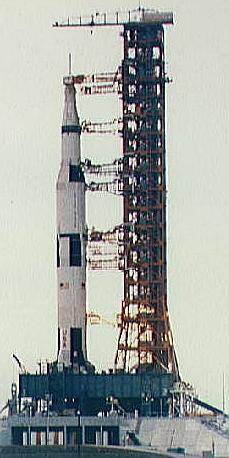 Launch Vehicle: Saturn V.
1966 November 9 - . 1967 October 28 - . Ground rules for Apollo extravehicular activity - . Nation: USA. Program: Apollo. Flight: Apollo 8, Apollo 9. The following ground rules were established for extravehicular activity planning. The EVA transfer would be demonstrated and thermal-degradation samples retrieved during the AS-503/103/LM-3 (Apollo 8) mission. No other pre-lunar-landing mission would include planned EVA exercises. The first lunar landing mission would be planned with two EVA excursions. 1967 December 9 - . Competing Apollo LM ascent engine qualification dates provided - . Nation: USA. Program: Apollo. Flight: Apollo 9. Spacecraft: Apollo LM, LM Ascent Propulsion. 1968 January 5 - . 1968 January 11 - . 1968 February 26 - . 1968 March 6-7 - . Design Certification Reviews of Apollo Apollo CSM 101 and LM-3 - . Nation: USA. Program: Apollo. Flight: Apollo 9. Spacecraft: Apollo LM, CSM Block II, CSM SPS. Design Certification Reviews of CSM 101 and LM-3 were held at MSC. Significant program-level agreements reached included validation of a 60-percent-oxygen and 40-percent-nitrogen cabin atmosphere during launch; reaffirmation of the February 6 Management Council decision that a second unmanned LM flight was not required; and the conclusion that, in light of successful static firing of the 102 service propulsion system and subsequent analysis, a static-firing of the 101 system was not required. Delays in Apollo CSM and LM delivery dates - . Nation: USA. Related Persons: Low, George. Program: Apollo. Flight: Apollo 9. Spacecraft: Apollo CSM, CSM Block II. 1968 May 28 - . Test to detect toxic hazards inside Apollo spacecraft - . Nation: USA. Program: Apollo. Flight: Apollo 9. Spacecraft: Apollo LM, CSM Block II, LM Crew Station. 1968 June 10 - . 1968 August 7 - . Apollo Review Board certifies the design of Apollo LM-3 - . Nation: USA. Program: Apollo. Flight: Apollo 9. Spacecraft: Apollo LM. 1968 September 25 - . Concerns over quality coverage of Apollo spacecraft testing - . Nation: USA. Program: Apollo. Flight: Apollo 9. Spacecraft: Apollo CSM, CSM Block II. 1968 October 21 - . Final countdown for the launch of Apollo 8 - . Nation: USA. Program: Apollo. Flight: Apollo 8, Apollo 9. Final countdown for the launch of Apollo 8, the second manned Apollo mission, began on schedule at KSC. Significant launch preparation events included the "wet" countdown demonstration test on December 10, three days of flight simulations, an operational review, and launch site recovery exercises. Mission preparations were on schedule for launch on December 21. Launch preparations were also on schedule for the next two flights, Apollo 9 and 10. Plans for television cameras aboard remaining Apollo missions - . Nation: USA. Related Persons: Low, George. Program: Apollo. Flight: Apollo 13, Apollo 9. Spacecraft: Apollo LM, CSM Block II, LM Television. ASPO Manager George M. Low apprised Program Director Samuel C. Phillips of MSC's plans for television cameras aboard remaining Apollo missions. 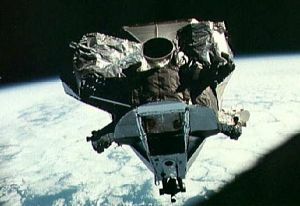 With the exception of spacecraft 104 (scheduled for flight as Apollo 9), television cameras were to be flown in all CMs. Also, cameras would be included in all manned LMs (LM-3 through LM-14). 1969 January 3 - . Mission preparation for Apollo 9 continued on schedule - . Nation: USA. Program: Apollo. Flight: Apollo 9. Mission preparation for Apollo 9 continued on schedule. Rollout of the space vehicle from the Vehicle Assembly Building, KSC, began. Mission Control Center simulations checkout, which began at MSC on December 20, 1968, was proceeding on schedule. Also, a series of thermal vacuum tests was completed, with the Apollo 9 crew using extravehicular mobility unit (EMU) flight equipment. Wind up of these tests completed the required EMU testing for the Apollo 9 flight. 1969 January 15-17 - . Launch Vehicle: Saturn V.
1969 January 19-22 - . 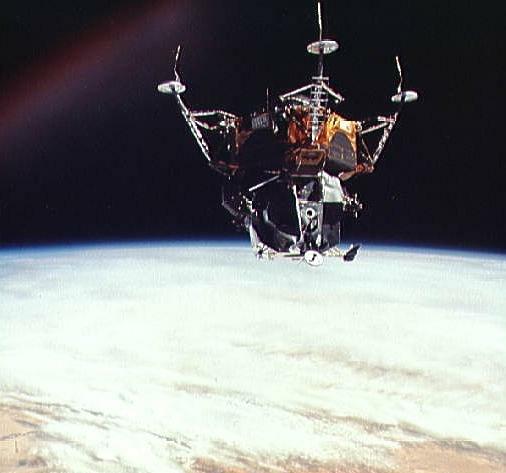 Apollo 9 flight readiness test - . Nation: USA. Program: Apollo. Flight: Apollo 8, Apollo 9. The Apollo 9 flight readiness test began on January 19 and was successfully completed January 22, in preparation for a February launch. A one-day delay in the testing was caused by a loss of air conditioning for the RCA-110A computer. The hatch and side windows of the spacecraft were being modified to overcome the fogging effect experienced during the Apollo 8 mission. 1969 January 24-29 - . Tests completed for the Apollo 9 launch - . Nation: USA. Program: Apollo. Flight: Apollo 9. The following tests were completed in preparation for the planned February Apollo 9 launch: all Mission Control Center data system integration tests, MSC preflight readiness test, KSC launch readiness test, and MSFC preflight test. In addition, recovery training exercises were conducted aboard the U.S.S. Guadalcanal , the prime recovery ship for Apollo 9. Apollo CSM Flight Readiness Review Board - . Nation: USA. Program: Apollo. Flight: Apollo 9. Spacecraft: Apollo CSM, CSM Block II. The CSM Flight Readiness Review Board convened at MSC. Martin L. Raines presented the Reliability and Quality Assurance assessment and pointed out the improvement in discrepancy reports between spacecraft 101, 103, and 104 and concluded that 104 was better than 103 and ready to fly. George M. Low noted that the CSM Review had been outstanding. 1969 February 22 - . 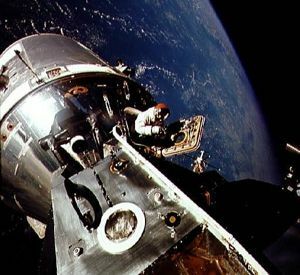 Apollo 9 countdown began - . Nation: USA. Program: Apollo. Flight: Apollo 9. Spacecraft: Apollo LM. The Apollo 9 countdown to launch began, with launch scheduled for liftoff February 28. The 10-day flight would mark the first manned earth orbital flight of the lunar module, the first Apollo spacewalk, and the first manned checkout, rendezvous, and docking operations of the complete Apollo spacecraft. The Apollo 9 mission would be open-ended, allowing the mission plan to progress from one step to the next on the basis of real-time success. Apollo 9 LM - . Call Sign: Spider. Payload: Apollo LM 3. Mass: 14,530 kg (32,030 lb). Nation: USA. Agency: NASA Houston. Program: Apollo. Class: Moon. Type: Manned lunar spacecraft. Flight: Apollo 9. Spacecraft: Apollo LM. Duration: 10.04 days. Decay Date: 1969-03-13 . USAF Sat Cat: 3769 . COSPAR: 1969-018x. Apogee: 187 km (116 mi). 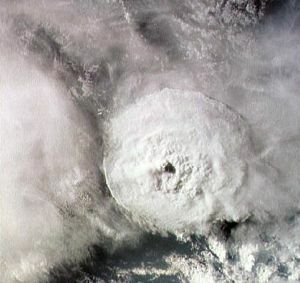 Perigee: 185 km (114 mi). Inclination: 32.60 deg. Period: 88.60 min. 1969 March 13 - . Landing of Apollo 9 - . Return Crew: McDivitt, Schweickart, Scott. Nation: USA. Related Persons: McDivitt, Schweickart, Scott. Program: Apollo. Flight: Apollo 9. The Apollo 9 CM splashed down in the Atlantic 290 kilometers east of the Bahamas at 17:01 GMT. The crew was picked up by helicopter and flown to the recovery ship U.S.S. Guadalcanal within one hour after splashdown. Primary objectives of the flight were successfully accomplished. 1969 March 28 - . Launch Vehicle: Saturn V.